Yesterday, I came across this piece in my closet. I designed this sweater when I was a fashion design student in London. 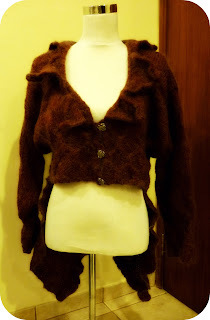 I designed the basic cardigan shape, then it just kept growing from there. As well as being intrigued by cables, I was really into tails at the time and added them to many things I designed. The final touch was the collar with some generous overstitching on the edge of the collar that made it ruffle up. I really enjoyed wearing this in the cold London winters. 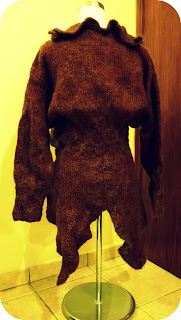 This sweater made its debut on a small catwalk in a London nightclub, as part of a fashion show that was put together by some fellow design students. I felt sorry for the model under the hot lights in a wool cardigan, but she put on a brave face and made it look like something that should be worn in a trendy club. I wish that I would have focused more on designing knitwear when I was in college, because it took me several years to figure out that it is my passion. If I had the chance to do my final design project again, I would create an amazing crochet collection! Since there is no point in looking back now. I will look ahead now and see what I can do with my design future! I hope that as 2010 progresses, my design career will begin to flourish.